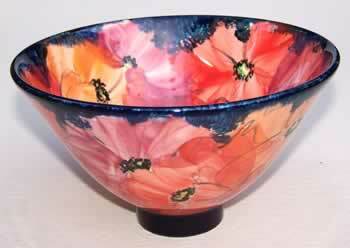 Ken and Valerie Shelton make all their work by hand; each piece is individually crafted in their Cheshire studio. Ken makes the pots from fine white earthenware. Pots thrown on the potter’s wheel are left to dry to a “leather hard” state and are then turned on the wheel, trimming away excess clay to produce the final shape and a smooth polished surface. Valerie decorates each piece with free-hand painting using ceramic colours; no transfers or guidelines are used so each piece is truly unique. A transparent glaze is applied over the colour and the pot is fired again in the kiln to over 1100°C. Our entire catalogue is now available to view online! Ken and Valerie Shelton are proud to have been elected Professional Members of the Craft Potters Association of Great Britain.